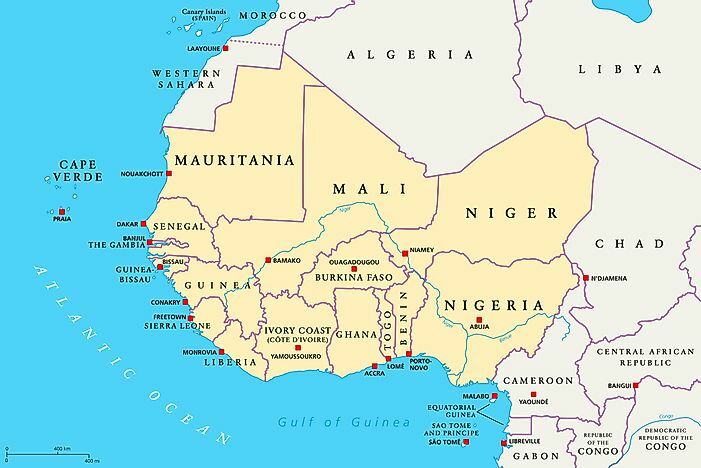 West Africa is composed of 17 African nations. Among the five common sub-regions of the African continent, there is the sub-region of West Africa. This region should not be confused with the Maghreb region, which is classified as being part of North Africa. This region, which has a total of 17 nations, is the second largest region in the continent after Eastern Africa. Of these 17, only three countries, Burkina Faso, Niger, and Mali, are landlocked with the rest having access to a major water body. Of the remaining 14 nations in West Africa, only one country, Cape Verde, is an island nation while there is one United Kingdom territory that is known as Saint Helena, Ascension and Tristan da Cunha. The remaining 12 countries are Benin, the Ivory Coast, Gambia, Ghana, Guinea Bissau, Guinea, Liberia, Mauritania, Nigeria, Senegal, Sierra Leone, and Togo. Including the broad definition of the Maghreb region, West Africa has a total area of approximately 2,370,667 miles squared (about a fifth of Africa). Most of the lands in the region are made up of low-lying planes that do not go beyond 984 feet above the level of the sea. However, there are a few high points that are scattered all over the region. In the northern region of West Africa, excluding the western side of the Maghreb, there is a semi-arid land known as the Sahel. The Sahel provides a bridge between the savannah region of Western Sudan and the extensive Sahara Desert. A belt of forests with widths ranging between 99 miles and 149 miles has been created by forests between the southern coast and the savannahs. On a broad scale, the Atlantic Ocean is deemed to be the border of the region to the west and the south while the Sahara Desert is the border to the north. The northernmost area of West Africa is the Ranishanu Bend. A debate arises when it comes to the determination of the eastern border. Some people argue that the Benue Trough is the eastern border while others argue that the eastern border runs from Lake Chad to Mount Cameroon. There are a variety of cultures in the region ranging from Nigeria all the way to Senegal in the far west. However, these cultures are mostly similar with similarities visible in things like music, dress, and a few other things. These similarities are estimated to go all the way back to the times of the Ghana and the Mali Empire, or even earlier than that. The region’s cuisine is particularly popular among the numerous visitors to the region. The food is popular all over the world in other places such as the Caribbean, the US, Australia, and other places. While these recipes have been altered a little, the heart of the meals is in West Africa. Some of the foods that are popular in the region include the likes of fish, fruits, and vegetables. Naturally, the food prepared in the different countries is different in the recipes they use but are similar in more ways than they are different. Other West African foods and delicacies include cassava, plantains, rice, sweet potatoes, and others. Similarities also exist in the clothing styles and culture. Unlike other regions, West Africans have been masters of embroidering and hemming for far longer. Similar techniques are employed in the making of breeches, tunics, and other clothes. As a result, the majority of the population wears different clothes but with similar underlying designs. Common formal wears from the region include the likes of the Boubou robe, the Senegalese Kaftan, and a few others that date as far back as the 12th century. In the coastal areas, the people wear huge rectangular garbs in a manner that is reminiscent of the togas worn by the Romans. Other similarities in culture are seen in things such as the architecture employed in the construction of buildings, music, and even the film industry. Islam is the most dominant religion in the area with about 70% of the population being Muslims. Merchants introduced the religion to the region back in the 9th century. Today, the religion is practically ingrained into everything and is responsible for determining the way of life, dressing, values, and other things. However, there are countries that used to practice the religion even before the merchants showed up. These countries include the likes of Senegal, Niger, Mali, Gambia, and Guinea. Other nations such as Nigeria, Togo, and others only had some sections practicing Islam before the merchants. Christianity is a relatively new religion after its introduction in the later stages of the 19th century, which was around the same time the British and the French showed up. Most of the Christians are composed of Roman Catholics and Anglicans, much like Christianity in the west. The religion has become the main one in some parts of Nigeria and the coastal stretch between southern Ghana and Sierra Leone. However, the religion, together with Islam, has become tangled up with elements of traditional religions from the region. The traditional beliefs in the region are the oldest and have been somehow integrated to some degree into Christianity and Islam. They include the likes of the Yoruba religion, the Akan religion, and a few others. Regarding languages, the majority of the population speaks Niger-Congo languages, which are mostly from non-Bantu tribes. Some of the major tribes speaking these Niger-Congo languages include the likes of Yoruba, Fulani, Akan, Igbo, and the Wolof tribes. Other significant languages include the Tuareg language and Chadic-languages. The Colonials also played a significant role in the determination of national languages of most countries. For most countries, the national languages are European languages such as English, Portuguese, and French. Arabic is more common further inland in the north. The Economic Community of West African States (ECOWAS), which was established in 1975, oversees the region’s economic needs. Another smaller body, the West African Monetary Union, is responsible for the economy of a smaller group of eight countries that use the CFA franc. Mali, Burkina Faso, and Niger also have their own body known as the Liptako-Gourma Authority. Women have also been vocal in recent times in the peace efforts in the region. Which Countries Are Part Of Central Africa?